Lo-Lo when she was a wee one. She's still 2,000% playful. 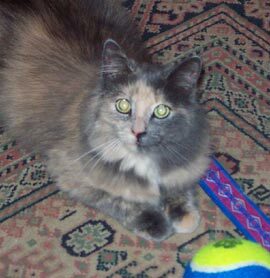 Lo-Lo is a fluffy grey calico & was the easiest feral of all to tame. She was purring at the vet's the very next day. She is just 100% sweet and is always smiling & purring. Lo-Lo was about 3 months old when we trapped her. Fortunately, she's healthy & very well-adjusted. 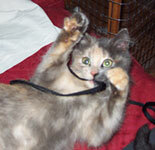 She's as playful & as affectionate as can be. She's the most hyper of all the CR!FR cats, the undisputed silliest. Constantly meowrling for attention. She loves tearing around attacking folds in fabric, & plundering pillows on the sofa. But mostly, relentlessly pestering you to play when you're trying to work on the computer. Lo-Lo has several unique expressions: an inquisitive high-pitched mew for a greeting, a hilarious prolonged warbling squeal for an invitation to play, and a manic lower-pitched gurgling squeal that insists you pick up the string & play. Sometimes, all 3 are strung together in a sustained phrase of manic enthusiasm. Lo-Lo for the delay on launching this site!